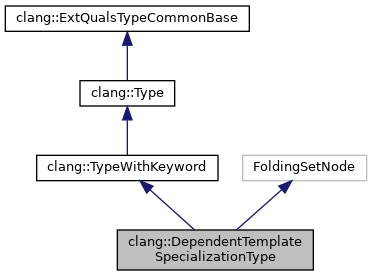 Represents a template specialization type whose template cannot be resolved, e.g. Definition at line 5276 of file Type.h. Definition at line 5321 of file Type.h. Definition at line 5323 of file Type.h. Definition at line 5340 of file Type.h. Definition at line 5327 of file Type.h. Definition at line 689 of file TemplateBase.h. Definition at line 700 of file TemplateBase.h. Referenced by MarkUsedTemplateParameters(), and clang::TypeLocReader::VisitFunctionTypeLoc(). Definition at line 5306 of file Type.h. Referenced by mangleAArch64VectorBase(), and clang::ASTNodeImporter::VisitDependentTemplateSpecializationType(). Definition at line 5303 of file Type.h. 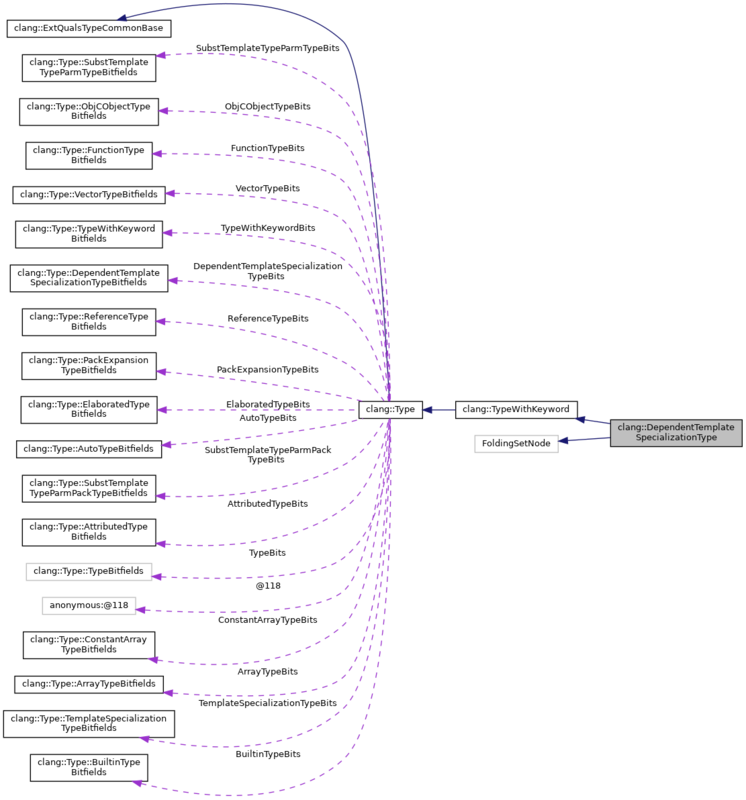 Referenced by clang::getParameterABISpelling(), mangleAArch64VectorBase(), clang::TreeTransform< Derived >::RebuildQualifiedType(), clang::TreeTransform< Derived >::TransformDependentTemplateSpecializationType(), clang::ASTNodeImporter::VisitDependentTemplateSpecializationType(), and clang::ASTTypeWriter::VisitTagType(). Retrieve the number of template arguments. Definition at line 5311 of file Type.h. Referenced by mangleAArch64VectorBase(), MarkUsedTemplateParameters(), clang::ASTNodeImporter::VisitDependentTemplateSpecializationType(), and clang::ASTTypeWriter::VisitTagType(). Definition at line 5302 of file Type.h. Referenced by clang::getParameterABISpelling(), mangleAArch64VectorBase(), MarkUsedTemplateParameters(), clang::ASTNodeImporter::VisitDependentTemplateSpecializationType(), and clang::ASTTypeWriter::VisitTagType(). Definition at line 5326 of file Type.h. Definition at line 5329 of file Type.h. Definition at line 2696 of file Type.cpp. Definition at line 5317 of file Type.h. Definition at line 5279 of file Type.h.